The Nitty Gritty Dirt Band On Mountain Stage This week on Mountain Stage, we travel to one of country music's birthplaces, the historic town of Bristol on the border of Tennessee and Virginia to hear the country-rock veterans in The Nitty Gritty Dirt Band revisit their 45-year career. 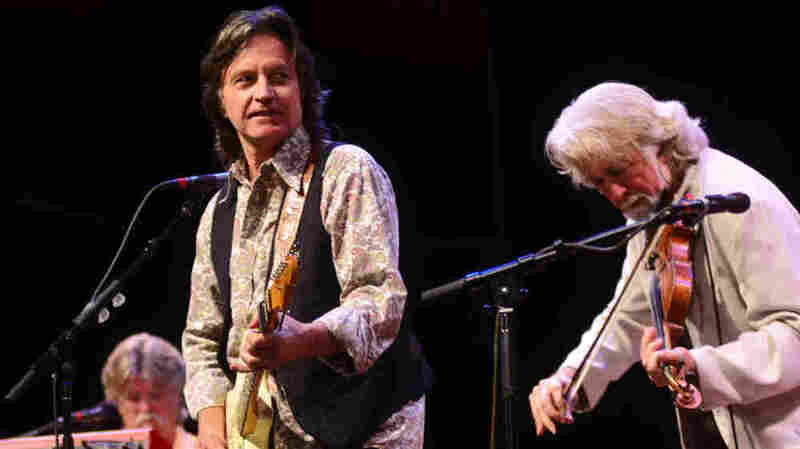 The Nitty Gritty Dirt Band perform in Bristol, Tenn./Va., for Mountain Stage. "Tulsa Sounds Like Trouble To Me"
This week marks Mountain Stage's return to country-music birthplace Bristol, the historic border town in Tennessee and Virginia where The Carter Family, Jimmie Rodgers, the Stoneman Family and more recorded some of country music's earliest hits. The visit is in conjunction with the release of a new box set of the 1927-28 recording sessions, Bristol Sessions: The Big Bang of Country Music. The pioneering group The Nitty Gritty Dirt Band, which re-introduced America to country legends Doc Watson, Roy Acuff, Earl Scruggs, Jimmy Martin and Mother Maybelle Carter with its landmark 1972 album Will the Circle Be Unbroken, were a fitting choice to appear in Bristol. Since its formation in California some 45 years ago, The Nitty Gritty Dirt Band have recorded folk, bluegrass and country rock, and laid the foundation for generations of bands, from The Eagles to Alabama to Uncle Tupelo. The group plays a selection of tunes from its storied career, including "Mr. Bojangles" and "You Ain't Goin' Nowhere," along with "The Resurrection" and "Tulsa Sounds Like Trouble to Me" from its most recent release, Speed of Life.